My mom always made these for our birthdays and we all used to love it because we can get to eat more. Now as a mom, I would still prefer giving these chocolates to my daughter than the store bought ones as it is made without artificial sweeteners or high fructose corn syrup or any other preservatives. 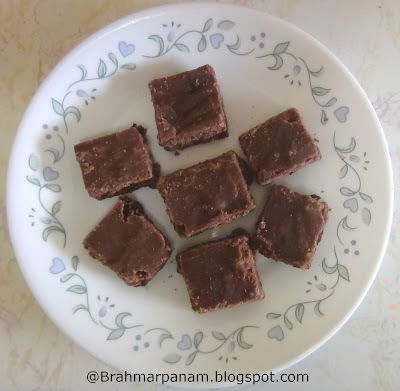 This is a simple recipe that takes less than 10 min to make and you can use your creativity to make a variety of chocolates. Grease a flat tray with a little ghee and keep aside. Mix the milk powder and cocoa powder well so that they are evenly mixed. Heat a pan with 1/4 cup water and sugar. When the sugar syrup reaches a string like consistency, add the butter, milk and cocoa powder mixture and nuts (if you are adding) and mix well for 1 more minute and then pour the batter into the greased tray. When it cools down, cut the chocolate into squares and store it in an airtight container once it is cooled completely. You can skip the cocoa powder for a milky bar kind of chocolate. You may skip the nuts for the plain chocolate and add them if you want a fruit and nut kind of chocolate. You can use different brands of cocoa powder to get the difference in the taste of the chocolates. If you add a tsp more of cocoa powder you would get the dark chocolate variety. Hi! tried your chocs with 1/4 cup milk powder n adjusted other ingredients accordingly. Tasty but came out crumbly.cud u tell me where I cud hv gon wrong.thnx quick n tasty recipee! If the sugar syrup is overheated, the chocolate will crumble. When you dip a spoon in the syrup and lift it up, the syrup should begin to drop like a single string. The moment the syrup reaches this consistency add the other ingredients and follow the recipe.